The Master in Advanced Ecological Buildings is an 11-month immersive academic programme with an emphasis on using a practice-oriented approach to train professionals with advanced expertise in the design and construction of ecological buildings. The programme takes place in the Valldaura Labs, in Barcelona, Spain. After developing the aforementioned skills, students will collectively create the design concept, strategies, fabrication techniques and blueprints for an ecological building prototype, which they will build during the last three months of the programme. Additional information The Full Tuition Fee includes the price of the academic programme (Non-EU citizens 19.250€ & EU citizens 15.400€) together with other fees such as accommodation in shared rooms, full board, laundry, use of the washing machine, WIFI, access to the Green Fab Lab and expenses at Valldaura Labs. *Transportation and other services not mentioned are not included. Current discourses on sustainability and design do not yet adequately frame questions of energy and ecology. Whether you consider how building design overlooks landscapes and urbanisation interdependencies, or how incomplete interpretations of ecological processes could otherwise better support buildings, urbanisation, and life today, or how the material choices in buildings are governed by stylistic abstract notions instead of something ecologically more powerful, the Master in Advanced Ecological Buildings aims to achieve a more ambitious and comprehensive approach of energy and ecology for the built environment. Following up on the urban research conducted by IAAC in the last several years in fields such as Solar Housings, Eco neighbourhoods, Internet of Energy, Hydrogrid, and Digital Fabrication, the Master in Advanced Ecological Buildings is orientated towards training professionals in the design, prototyping, and fabrication of buildings as ecological and thermodynamic systems. This framework of thinking and operating couples both small and large-scale processes: from the material to the geographical scales. For example, the design of urban wood buildings has far-reaching effects on forestry practices or global carbon cycles. How designers might better characterise the exchanges and feedback looks and potential retrofitting of matter and energy across this multiple spatial and temporal scales are central to the pedagogy of this Master. This approach is necessary for a more thermodynamically forceful and ecologically powerful design practice for the future. The MAEB allows students to examine material and energy issues – broadly defined, from the material to the geographical – across disciplines and scales, taking full advantage of the unique location of Valldaura Self–Sufficient Labs: IAAC’s fabrication lab located in the forest, its fabrication infrastructure and the potentials of its surrounding territories. The curriculum of the programme is diverse: from short workshops with leading experts to module courses, regular seminars and lectures, and a year-long project with an emphasis on real-scale prototyping. The Master addresses the question of the design as a comprehensive, intellectual and applied project in which prototyping and fabrication processes are a central pedagogic component, emphasising the role of the architect as a hands-on applied maker. 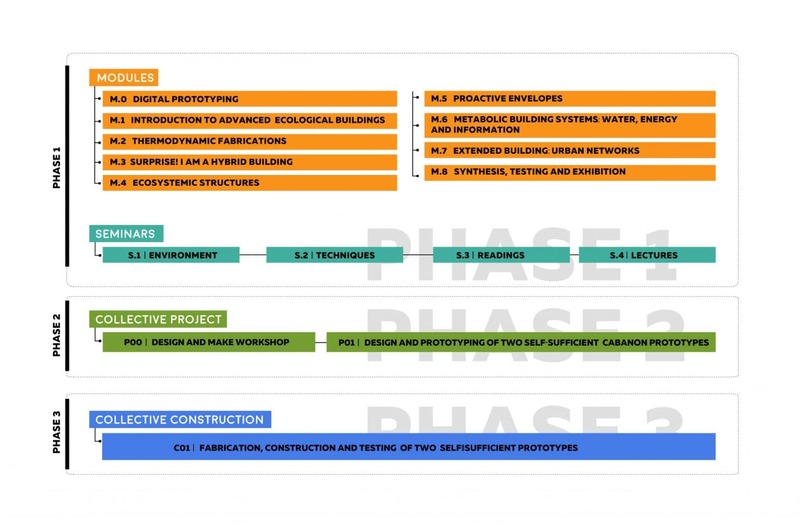 Each Master candidate will develop technological and fabrication seminars, ecological and thermal analytical frameworks, and real-scale prototypes to have a unique expertise in the development of ecological and thermodynamic buildings. The Master will also provide a unique opportunity to create a real-size building prototype as the final Master project. From the material to the territory, the Master in Ecological Buildings foresees the design, development, and implementation of a new wave of buildings, prototypes, technologies and design solutions of true ecological value that can be extended systematically to be part of the next urban future. The Master programme is orientated towards engineers, architects, artists, makers, designers, and graduates in any discipline related to the crafting of the built environment. The programme will be developed with the collaboration of companies and industry leading experts from around the world with the goal of forming new professionals interested in leading the design of ecological buildings worldwide. The programme is led by Vicente Guallart, the former chief architect of the city of Barcelona, one of the world’s leading cities for architecture. Barcelona is constantly developing a signature design and the construction of its advanced buildings and environments is recognised worldwide. Immersive Education: This Master offers a unique immersive education experience at Valldaura Labs. Sleeping, eating, socialising, studying, prototyping, designing, and building all happens at this unique location. Learning by Doing: Students learn based on their own experience and through hands-on building full-scale prototypes. This Master is fundamentally hands-on with an emphasis on professional expertise. Every year of the Master programme will build a 1:1 building prototype. Multidisciplinary Education: Students will have access to courses and workshops from all disciplines around buildings. Connected Education: Students collaborate with other academic design centres and institutions that are developing similar projects. Recording Process: Each student registers and documents all the knowledge generated by the Master programme in a unique and open online platform. International community: This Master programme is oriented towards students both from mature economies, such as Europe or North America, as well as emergent economies such as China, India or Latin America. 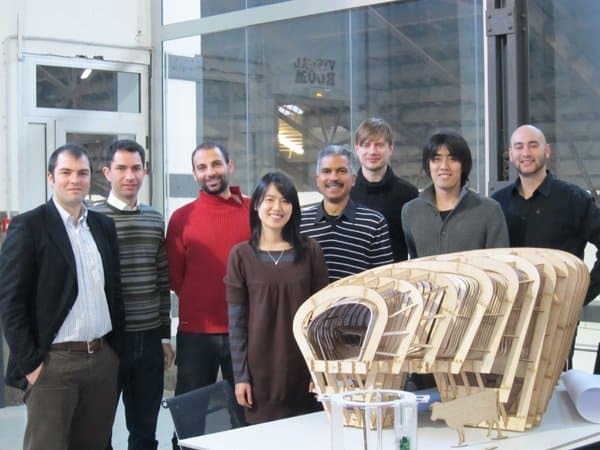 IAAC’s immersive Master in Advanced Ecological Buildings (MAEB) is an innovative educational format that offers interdisciplinary skills and understanding through the research on new categories of projects, technologies and solutions related with the design, prototyping, and fabrication of ecological buildings. IAAC gives students the opportunity to create individual Studio agendas and develops Thesis Projects based on ecological design, thermodynamics applied to buildings, new fabrication techniques, material experimentation, solar technologies and more. In this way, IAAC puts together an experimental and learning environment for the training of professionals with both intellectual and applied responses to the increasing complexity and environmental pressures of contemporary urban environments. Students have the opportunity to be part of a highly international group, including faculty members, researchers and lecturers, in which they are encouraged to develop collective decision-making processes and materialise their project ideas. The Master develops seminars, workshops, studios and master classes along these thematics: Contemporary Theory and Practice of Ecological Architecture, Digital Fabrication, Ecology, Solar Energy and Thermodynamics, Eco-Materials, Advanced Structures and Metabolic Building Systems. Valldaura Labs is a living lab and centre for research on self-sufficient habitats. 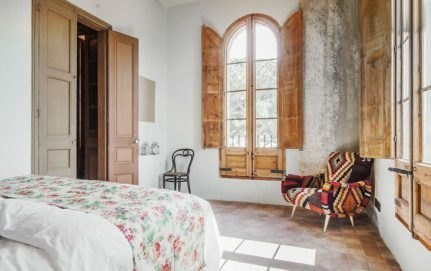 Built around a XIX s. traditional Catalan Masia, its infrastructure aims to become a prototypical place for architecture and ecology in the post-carbon era. It aims to produce food, energy, and things. Located in Collserola park, 30 minutes away from the centre of Barcelona, the lab has an area of 130 hectares. Valldaura has a Green Fab Lab facility part of the MIT’s Fab Lab network and has a full digital fabrication facility. Also, this lab provides living space for 25 students. This module introduces students to Valldaura Self-Sufficient Lab. It develops a deep exploration of the geographical, climatic, ecological features of the site of future prototyping and experimentation. Including spatial and quantitative data, the goal of this module is to introduce students to the local dynamics of the place. Tree species, soil composition, material cycles, radiation, wind, temperature, humidity, biota, facilities, infrastructures, will be some of the components investigated. Output: A series of cartographic representations. This module playfully develops morphological prototypes derived from heliotropic inputs explored in the previous module. These morphological prototypes respond only to external inputs, regardless of any internal configuration. This includes radiation as a main parameter but also humidity, temperature and wind flows. These inputs are the only design inputs to start crafting form-oriented prototypes. There is no consideration of any active systems. The goal of this module is to explore design strategies where form follows heliotropic inputs. Questions of compactness, slenderness, expansivity, horizontally, fragmentation, as well as the positionality (over, under, elevated, etc), are exposed to formal transformation by solar, wind and temperature inputs. This module develops morphological prototypes derived from thermodynamic inputs. In contrast with the previous module, this is only concerned with internal thermodynamic factors such radiation, convection, conduction, regardless of any external form. The goal is to find out what are the internal forms and spaces that could be created following different thermal flows. This internal exploration with revisited devices such as courtyards, atriums, solar chimneys, double skins, horizontal galleries, diagonal ventilation, etc.. Considering only the active spatial devices this module adds another layer of transformation to the previous modules. It enhances the performance of building prototypes by critically exploring available and new potential technological devices that could be implemented in the project. Wind turbines, solar panels, responsive facades, digital devices are some of the multiple device explorations possible to be developed and implemented in this module. Buildings are bundles of materials and flows that are in constantly flowing in and out of its footprint. This module explores these metabolic systems that support the daily life of buildings to projectively envision new ways of dealing with them. If most of the buildings today have a linear metabolism, consuming resources, energy, water and information and generating waste products and emissions, the potentials to develop the building as a circular metabolism is yet to be fully developed. By looking at water systems, foods, information, carbon emissions, waste products, the goal is to come up with feedback loops that enhance the ecological performance of buildings. One of the biggest environmental impacts of buildings is its material configuration. This module explores the use of materials that are attentive to environmental impacts. For instance, the manufacturing of one cubic meter of concrete generates twenty-eight times the carbon footprint of the manufacture of a cubic meter of wood. Analysing these aspects will be a key entry to material exploration. In addition, the research on the location of manufacturing and extraction of materials is the central aspect of this module as well. An important part of the environmental impacts of materials come through the transportation from origin to destination. So a local manufacturing of a high intense carbon emission (ceramic) might be more ecological than a distant low intense carbon emission material (wood). Buildings are made of materials such as concrete, wood, ceramics but the materiality of buildings transcends the material selection itself. 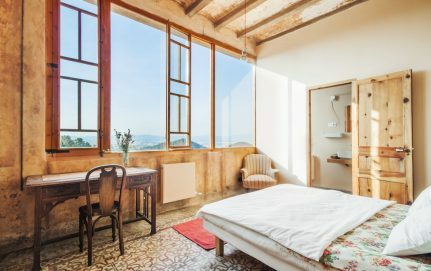 This module explores buildings as a material construct whose textures and materiality provides a gestalt unique to any project. Earthy, geographical, ethereal, crystalline, mossy, hairy are some of the approaches to materiality present today. This module explores this material aspiration to create more vivid and materially exuberant building that is something more than an assembly of materials. This workshop will consist in the production of several material prototypes and sculptures. After the loading of conditions for the design of ecologically positive buildings, this module explores its structural possibilities. Considering new technological advancements in manufacturing processes as well as in material innovations, this modules formalises the previous exploration in a structural scheme. This section will design, fabricate and test few structural variations of the project. The outcome of this module is a series of digitally fabricated models. An important percentage of the environmental, thermal and ecological performance of a building has to do with the façade. Historically at the centre of the design concerns, today façade design is in many cases the selection of solutions from pre-given catalogues and systems. This module is intended to control the performance of a building through its wall system. By designing the material(s), the arrangement of layers, thickness and its shape, buildings could achieve a much powerful environmental, thermal and ecological performance. With the neoliberal flexibilization of labour regimes and perpetual motion of people between places, this module critically explores how buildings can adapt to new programmatic and functional demands. The goal of this section is to develop hybrid programs that create both functional diversity but also adaptability to new forms of social organization and need. Considering the importance of hybrid programs for buildings but also the different temporal scenarios, this module aspires to position new architectures and buildings within the needs of contemporary society. While the effort of this Master is in the design and prototyping of ecologically driven buildings, this module will address the potential site settings that could be relevant to the project. Envisioning the complete design of the project in a particular place enables to think in questions of density, urban design, landscape architecture. 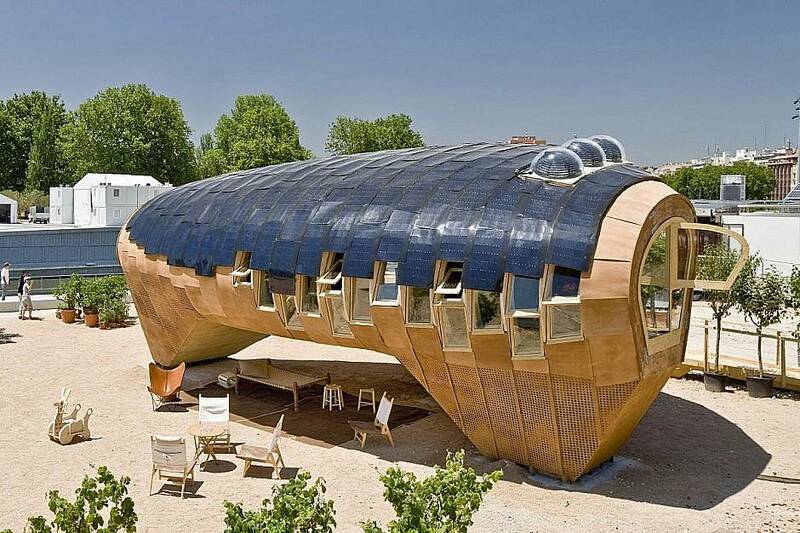 The goal, therefore, is to create larger systems having the eco-buildings as a unit. The goal is to explore potential feedback-loops and couplings with the immediate physical environment from an urban design and landscape architecture perspectives. The last module of will consists of simulation and testing of the project itself. Through powerful means of visualisation, the goal of this module is to back-up the design explorations with quantifiable data. From thermal testing to emergy accounting, to carbon emission measurements, each project is ecologically ranked. This seminar provides the opportunity to learn ecological principles on site. Forestry practices and regimes, ecological agriculture, permaculture are some of the environmental practices the seminars provide. Students will learn by doing some of these practices as part of the harvesting, production, and generation of material for future projects in the Master programme. This seminar provides the necessary training for students on the techniques of digital fabrication, including CNC milling, laser cutting, 3D printing but also carpentry and conventional fabrication and construction. This seminar will also cover all the necessary software instruction, including design, parametric and fabrication software. This seminar provides the intellectual and scientific foundation for all the related research, design and development of projects in the MAEB programme. These readings range from conceptual and theory readings which support the premise of the Master to precedent studies, construction strategies and innovative materials related to the execution of projects. Pre-opening lecture by Bjarke Ingels. 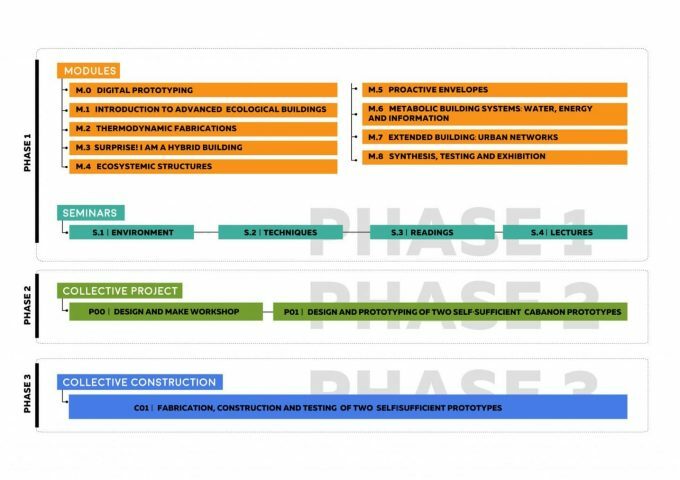 This block consists of the design and development of the technical documents of a real ecological building project that will be fabricated and built during the last two months of the programme. For that to happen, students will utilise all the knowledge and expertise acquired during the previous months working as a single team of faculty and students for the design development of the project. This phase of the Master will be joined by renowned experts that will advise on a series of topics ranging from ecological material to energy technologies. During two months, students will work on the construction of an ecological building at real scale. This building will integrate all the technical and constructive elements in other to make it livable. This process will utilise parametric design techniques, advance digital fabrication and ecological design principles. 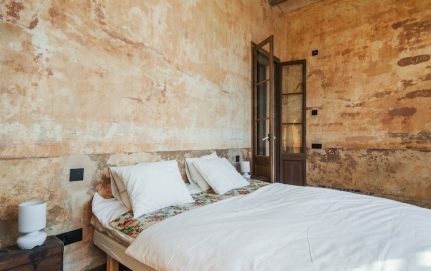 Students will live the experience of building it’s one building in collaboration with professionals and local experts in a unique natural environment. The project will be part of a villa with buildings designed by local and international architects. The Master programme is oriented towards engineers, architects, artists, makers, designers, and graduates from any discipline related to the crafting of the built environment. The programme will be developed with the collaboration of companies and industry leading experts from around the world with the goal of forming new professionals interested in leading the design of ecological buildings worldwide. The theme of the scholarship offered by the MAEB is focused on the dissemination of any topic related to “Advanced Ecological Architecture” through audiovisual media platforms. The MAEB programme is pleased to grant 3 scholarships to those students who can contribute to disseminate in a short film (between 2 – 10 minutes) the new ecological principles of the cities of the future using a creative approach. You can present a vision, an idea, a social initiative or a proposal about the world to come using original material or archive images. The audiovisual project submitted must be original and expressly produced for this call. We want to offer scholarships to students who can contribute during the master programme to film the educational projects that are developed within the Master in Advance Ecological Buildings in IAAC’s Valldaura Labs. 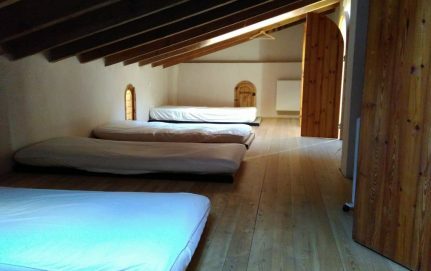 Valldaura offers accommodation for a total of 23 students. The programme is conceived to be an immersive experience. 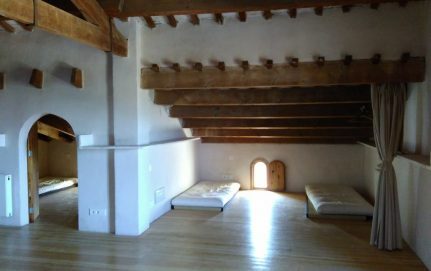 However, students can decide whether to live in Valldaura Labs or in Barcelona itself. Distance from the closest metro station to Valldaura Labs is 10 minutes by car or motorbike, 25 minutes by bike and 45 minutes walking.